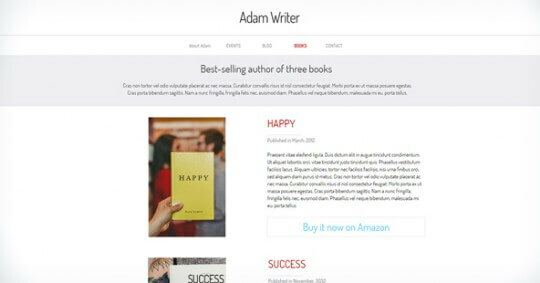 In this guide you'll find out how to create an ebook and publish it on Amazon or on your site. We'll see the best strategies to promote your book on social networks and how to sell it online (only proven results!). Is this only for aspiring authors? Definitely not! Just think about it. Today self-publishing means dealing with online marketing. If you're a food blogger, then you could make an ebook out of your recipes and publish it on your blog and on ebook stores. Or maybe you're a coach. Why not release a guide on Amazon and use it to promote your courses? Maybe you don't know that booklovers are an active web "tribe": they meet on Facebook groups, they use hashtags on Instagram and Twitter to chat about books' authors and genres, they build communities like Wattpad and Goodreads. Booklovers are such a powerful source for creating buzz on the internet. An ebook is the smartest way to take advantage of it: simple and fast to create. How to publish an ebook on Amazon? How to promote an ebook through social? When you start making an ebook, you should consider these two aspects: the file format you want to deliver and which software is the best you can use to create it. These are not secondary things. In fact, they determine whether you'll be able or not to release your book on the Apple iBook Store or on the Amazon Kindle Store. So you'd better pick the right format, uh? An ebook is a downloadable html file, that easily fits to device screen resolution. 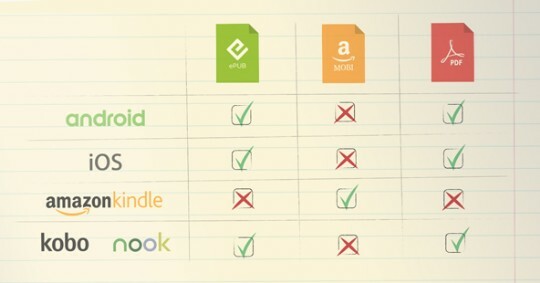 Not any device on the market is compatible with the 3 most popular ebook formats (ePub, Mobi, PDF) nor the ebook stores support them indistinctly. PDF: it can be opened on ePubs compatible devices, but also on computers; this format is less adaptive than the other two because it keeps the typical A4 page structure of a book. Now that you know which formats you can create, let's see which are the best programs to prepare the file and convert it into an ebook. If you're not familiar with professional editing software like Adobe Indesign or with an advanced ebook editor like Sigil, you can make an ebook from scratch simply by using Microsoft Word. This is not a joke, it's for real! After completing your manuscript, you just need to convert the Word document into an ePub with a free software called Calibre. 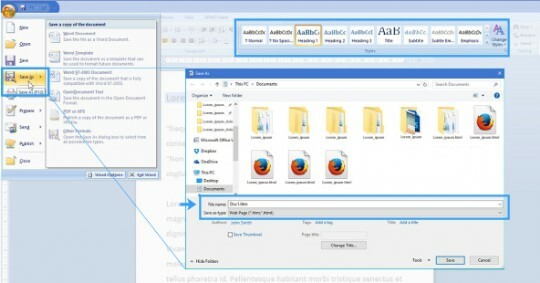 To convert from Word to ePub, you should follow the simple method explained in this Wiki How guide. 1. Set the document title and each chapter title in your Word document to "Header 1" and save as *.html. 2. 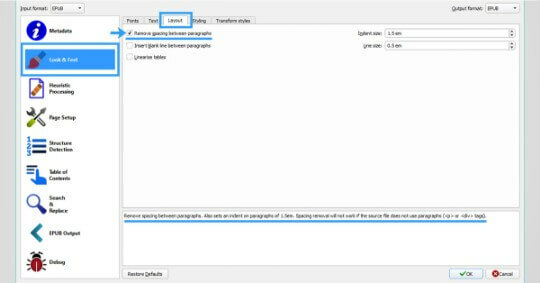 Remove the spacing between paragraphs in Calibre by clicking on Calibre > Convert books > Look & Feel > Layout > Remove spacing between paragraphs. 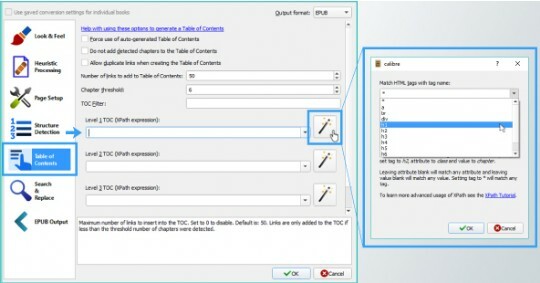 Convert the table of contents by going from: Calibre > Convert books > Table of Contents: fill in Level 1 (XPath expression) choosing tag "://h:h1". You can use Calibre to convert your docs into Mobi or other formats. Finding it hard to go this way? You can always use self-publishing services to create your ebook: many of them offer free conversion from authors' documents into the format distributed on their marketplace. We suggest you read carefully the step-by-step guides provided by these services, if you decide to use one. Now that you've turned your work into an ebook and prepared the file, it's time to publish! Where do I publish my ebook? On Amazon or on my website? Ever thought about it? Well, you're not the only one! If you want to know how to sell an ebook on Amazon or how to distribute it online, then you're in the right place. But before that, we'd like you to take some time to think upon an important matter. If you already manage a site or a blog, you should definitely publish your ebook there in the first place. We'll dig into it later, but the reason is simple: you have total control of your site and the income from ebook sales is 100% yours. Applying the right template to an e-commerce site that can sell digital products, your website makes as a real sale "hub" and a meeting point for your online community: it's like a piece of paradise where people can reach you for sure. On the other hand, Amazon is a huge company that can get you millions of readers! It's hard to ignore it! In fact, you shouldn't choose between Amazon and your website. They're both important channels to sell your ebook. So let's see how to publish a digital book on Amazon. The first thing you need to do is to create an account on Kindle Direct Publishing, the self-publishing service owned by the Seattle-based company. To do that, you can use your Amazon user account (so you know, the one you use to buy on the Amazon store) or create one from scratch. Type in the required informations: Title, Author, Description and Verifying Your Publishing Rights. Take time to decide your Title and Description because they're key factors to your sales. Don't forget to check "I hold the rights to this book" in the Verifying Your Publishing Rights section, to get the 70% royalties. To upload your book file to the Amazon KDP servers, the size of your Word document should not exceed 650 Mb. Launch the Amazon Kindle Cover Creator tool directly from the details page to create your book cover from a bunch of customizable templates. If you don't like the result or want to do everything by yourself, please watch this tutorial on how to make an ebook cover in Microsoft Word (yep, you got it, we mean Word) from Derek Murphy, a book designer who works with indie authors. Just keep in mind to save the image cover in JPEG or TIFF, which are the only formats supported on Amazon. Enrolling Amazon KDP, you can earn up to 70% royalty on sales in some countries if you choose the 70% royalty option (the most popular ). To take advantage of this opportunity, set a minimum price according to Amazon policy, which is between 2.99 and 9.99 dollars. Before publishing, remember to enter your Tax information into your KDP account. You can use your Fiscal Code to start selling. It should be easy to set up, but in case of need, the online Help is available in 8 languages. Congratulations! Now that you've published your first ebook on Amazon, you can start making money from your online sales! Before you start selling, focus on awareness. A good web-marketing strategy to promoting your book should include different actions aimed to get reviews. Share contents from your title on Facebook and on the most popular social networks; get in touch with bloggers of your niche, contact ebook promotion sites to tell them about your work and generate buzz. Engage readers they'll talk aboutyou andyour book. Here's some ideas you can instantly use to promote your ebook. You can find lots of people suggesting to create a Facebook Page about your book. Should you publish a new ebook, you'd find yourself in building your community entirely from scratch, again. You'd better use your personal profile or create a page to promote yourself as an author. In other words, build your "personal brand", rather than promoting one title at a time. Integrating Facebook into your website content strategy will get more results in the long term. Do you find this useful enough? Then stop here and skip to the how to sell more with a website section. But if you're looking for more inspiration, here's a few PRO tips for you. Ever heard of Goodreads and Wattpad communities? They're very popular with readers. 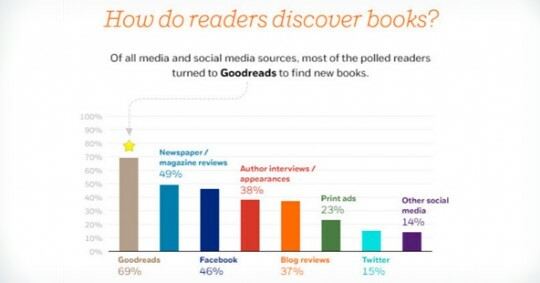 On a survey conducted by Random House on 40.000 readers, Goodreads turned out to be the most influential source to find books (not only fiction). Well, 55 million users make it a powerful authority online! Goodreads users share their list of favorite books and boost sales through reviews, so you should take them in good care. try with paid campaigns: with a little sum of money you can reach potential readers that are interested in your genre and increase in visibility by more than 56%. Wattpad collects the best fan fiction series around the web! Popular with kids, it's perfect if you write genre fiction ("young adult" in particular). Actually, this is the place where Anna Todd's "After" series and other teen bestsellers took their first steps. Publishing companies use the community for scouting unknown writers to launch on the market. Wattpadd works like serial stories in 19th century: authors put online one chapter at a time. So, to get the most out of Wattpadd, you should take that into account. #fridayreading: people meet on Twitter every Friday to share which books are reading. Use this popular event to tell about your book and create buzz. #bookstagram: this is the hashtag used by book cover lovers on Instagram. Share your passion for books with them. Though Indie ebook market share have dropped in 2016 (interrupting 2 years and a half of growth), people keep reading ebooks, especially from smartphones. Moreover, without the traditional publisher role, publishing a guide or any other book is faster. And more profitable. So creating your own website or starting a blog (if you haven't done it yet) put you on the right stage to show off your talent and increase sales from your ebook. These are essential factors for building an online community, improving your digital goods and increasing profits. This is true when you have the right tool to make your online store. Still sure that writing is the only skill you need to make money online from an ebook? As of today it will be easier for you to publish an ebook and get noticed online with our tips. Use a mix of talent and creativity to start writing a guide on what you love and follow this article step-by-step. You'll start earning in a snap.